OMG Posters! » Archive Emek's Mars Volta Poster (Onsale Info) - OMG Posters! 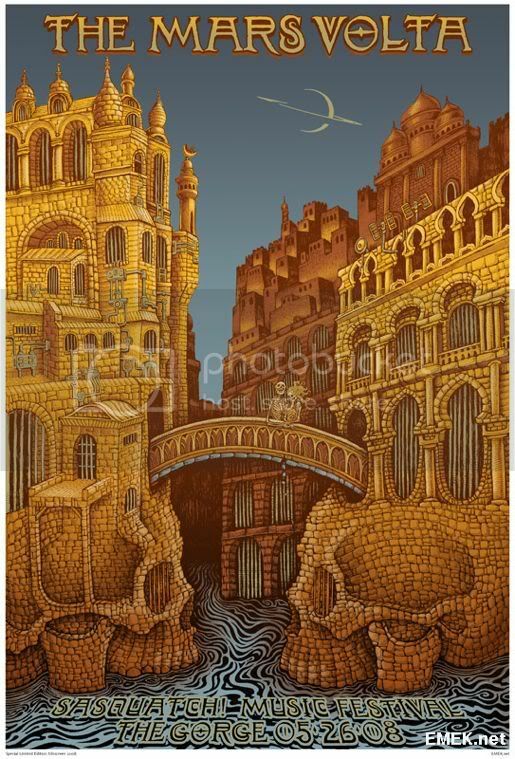 Looks like it will be a busy Saturday, as Emek will release his Mars Volta poster tomorrow. This one is a huge 23″ x 32″ screenprint with three blends. Also, ten lucky people will randomly receive variants. Hit the store/info section tomorrow (Saturday, August 23) at 11am PST. Visit Emek.net. I didn’t try for this one…I’m with Jennifer— bitter over the Jermaine Roger’s Neil print. Does this sort of thing happen a lot? I got that 1 too! Stoney also has original copies of the Dead Sea Scrolls, the Magna Carta, and J. K. Rowling’s unwritten Harry Potter prequel! No one found its similarities to Grateful Dead posters at all worthy of mention? They aren’t really very similar artists in any sort of way, but if the GD was from Earth, the Mars Volta is its doppelganger in a far off distance universe. doppelganger! ps this print is ok but not that great! pay 1500 bucks for it! I got lucky and scored this one. My 1st Emek.